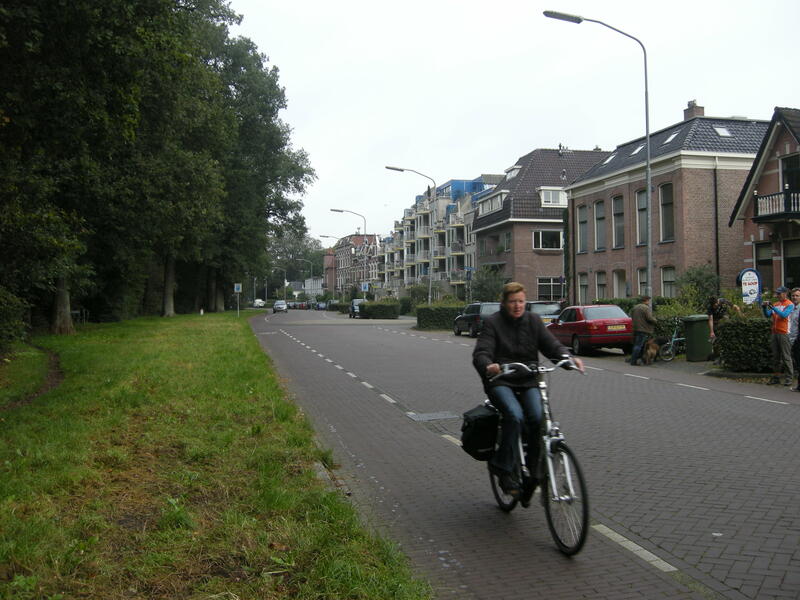 To those who point to the provision of cycle paths alongside roads with high volumes of traffic, or with high speed limits, as one of the principle ingredients of Dutch cycle policy - an ingredient that serves, partly, to explain why the Dutch cycle in such large numbers - some UK cycle campaigners opposed to such paths have a ready retort. segregated the roads and cycle paths into a system of Redways. These run through the grid-squares and were designed for leisure cycling. Despite this comprehensive network of segregated cycle paths, Milton Keynes has a dismally low level of cycling. Hard data is a little hard to come by, but 2001 figures quoted here suggest that the trip share of cycling in Milton Keynes, at 3% of all trips, is barely better than the national average. From these two facts - that Milton Keynes has a network of segregated cycle paths, and that it has no more cycling than any other typical town across the UK - some choose to draw the conclusion that there is no connection between the provision of cycle paths separated from motor traffic and the amount of cycling in a given place. This is superficially persuasive. Milton Keynes, we are told, has fantastic cycle paths, of a similar standard to the Netherlands, and yet nobody cycles there - at least, not in any greater numbers than across the rest of the UK. So, apparently, we shouldn't waste our time asking for cycle paths as part of a strategy to boost cycling levels, because they don't appear to be a way of encouraging people to cycle - at least in Milton Keynes. Unfortunately this argument - what I shall henceforth term, for brevity, the 'Milton Keynes Argument' - is entirely bogus; it rests on a misunderstanding of the use and purpose of cycle paths within a broader cycling strategy, and it also places far too much weight on an apparent correlation between cycle paths in Milton Keynes and the level of cycling there, while ignoring the several other variables in play. One, initial, way of demonstrating the flawed reasoning behind the Milton Keynes Argument would be to consider whether there would be more, or less cycling in Milton Keynes if there weren't any cycle paths at all. Are those who claim that cycle paths do not make cycling more likely really suggesting that if we were to strip out the cycle paths in Milton Keynes the amount of cycling there would stay the same, or even increase? That seems fantastically unlikely to me, given that the cycle paths, in the main, run alongside dual carriageways, often those with 70 mph speed limits. 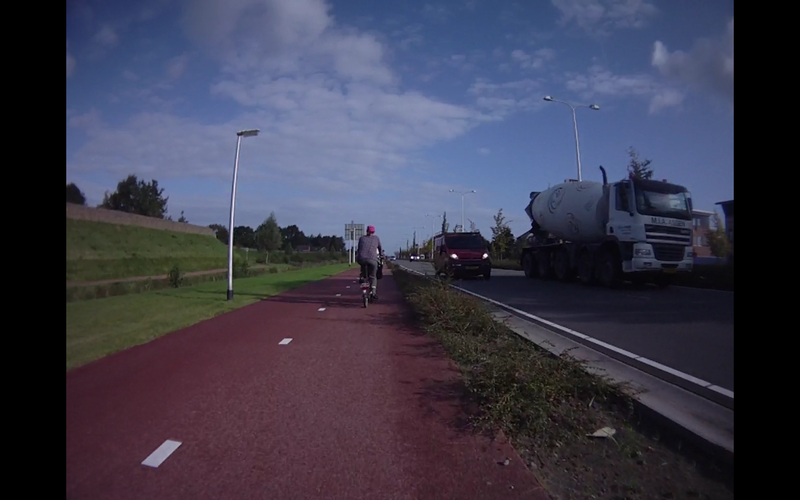 To pretend that people are just as likely to cycle on these kinds of roads as they would be on the cycle paths that run alongside them - cycle paths that, let's remember, are claimed to be as good as anything in the Netherlands - stretches credibility to breaking point. Yet this is what we have to believe if we think that there is no connection between the provision of cycle paths and the willingness of people to cycle, as we do if subscribe to the Milton Keynes Argument; we would have to believe that people are just as keen to cycle on the fast dual carriageways of Milton Keynes as they are on the allegedly well-designed cycle paths that run alongside them, because we believe that cycling is just as likely (if not more so), without cycle paths, on the existing road network. This is the very argument that John Franklin makes. 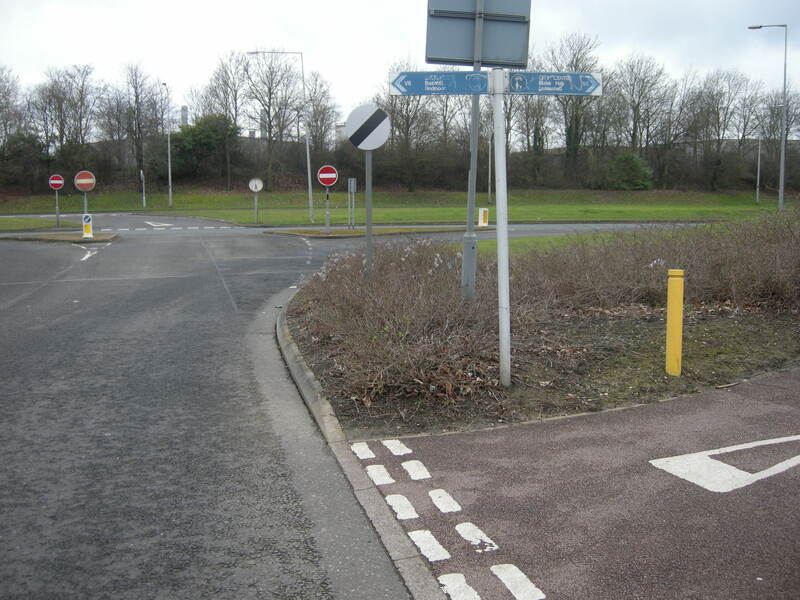 From the traditional viewpoint, Milton Keynes has the ultimate 'worst' and 'best' for cyclists. On the one hand is a high-speed grid road network, designed solely around the needs of motor vehicles and with large roundabouts at all principal junctions. On the other an extensive, purpose-built cycle path network, segregated for the greater part from fast traffic and constructed with few limitations of space or finance. If this is not the most perfect scenario for demonstrating how cycle facilities can remove the deterrents to cycling and achieve big gains in safety then what is? But the reality of Milton Keynes over two decades shows a different story, and one that could be no less valuable in achieving a better understanding of what really is needed to encourage cycling. Far from leading to a popularist renaissance for cycling, there is much to suggest that the Redway network has suppressed cycle use, and lowered the public's expectations of cycling as a mode of transport. I leave you to judge whether that is a sensible belief to hold. Needless to say, I think it would be more wise to suggest that without cycle paths in Milton Keynes, the levels of cycling there would be even lower than they are at present, because all journeys there by bike would then have to be made on fast, busy roads and across large multi-lane roundabouts, which would hardly be more appealing than cycle paths, however well- or poorly-designed (about which more below). Far from apparently suppressing Milton Keynes' cycling levels below the levels seen in some other UK towns and cities without cycle paths, it could very well be the case that the cycle paths there are the only thing keeping its cycling levels above water. Now you could reasonably say here that I am misinterpreting the Milton Keynes Argument. In more precise form, the Argument could be said to claim that cycle paths are unnecessary for increasing cycling levels. There is a reasonably large amount of cycling in Cambridge and Oxford, for instance; this has been achieved without cycle paths. Hence we only need to adopt the strategies seen in Oxford and Cambridge to achieve higher cycling levels elsewhere. I don't doubt that it is true that we can boost cycling levels without cycle paths; there are plenty of interventions that can be used to make cycling more likely, of which the most prominent are 'filtered permeability' - the blocking of cars from some routes, while still keeping them open for bicycles - and lower speed limits. I am not too familiar with Cambridge, but I do know that the very centre of Oxford has a good deal of filtered permeability that has served to create a reasonably subjectively safe environment for cycling. In a similar vein, it is claimed, with some justification, that the borough of Hackney in London has boosted cycling levels largely through a strategy of filtered permeability. But the author of this recently-published, albeit recycled, piece about Hackney goes further than simply trumpeting the success of permeability, and proceeds to imply that segregated cycle paths are unnecessary. Cycling is growing faster in the London Borough of Hackney than anywhere else in the UK, yet planners and transport professionals visiting this borough with a view to imitating its success on their own turf may be surprised to see little in the way of conspicuous cycle facilities. Danish style cycle tracks are nowhere to be found, and the 1000-strong local cyclists group, the London Cycling Campaign in Hackney, actively lobbies against the installation of cycle lanes.... Hackney has hardly any green painted cycle lanes and the few dedicated segregated cycle tracks that do exist tend to be there to facilitate cycle access where other motor traffic is not permitted, for example restoring permeability via a cycle contra-flow along a previously barred one-way street. This is the message of the Milton Keynes Argument, albeit in reverse; here, Hackney, is somewhere that has achieved some success without cycle paths. Meanwhile Milton Keynes has failed to achieve success with them. However, I am not sure, in either case, that we should conclude that cycle paths are unnecessary, because just while levels of cycling in Milton Keynes would probably be lower without cycle paths, levels of cycling in Hackney could be higher with them. I am, lest it need saying, not making an argument for cycle paths everywhere. What I am suggesting is that cycle paths, contrary to those who subscribe to the Milton Keynes Argument, are indeed necessary along a certain category of road - one that still carries high volumes of motor traffic, and/or fast motor traffic. While filtered permeability is indeed a very important part of the Dutch strategy - especially in residential areas where it is used to keep the number of motor vehicle journeys to an absolute minimum, without the presence of cycle paths - nevertheless, on Dutch roads and streets that do have a significant number of car journeys, cycle paths are nearly ubiquitous. To that extent, the proponents of the Milton Keynes Argument are making a category mistake. They are assuming that cycle paths and filtered permeability (or lower speed limits, or some such) are two different, interchangeable solutions to the same kind of problem, when in fact they are solutions to two different kinds of problem. Now I am firmly of the opinion that far too many journeys in the UK are made by motor vehicle. However, I am not so naive as to believe that journeys by motor vehicle can be eliminated completely. We will still have roads and streets that will need to accommodate journeys by motor vehicles. To give a few examples, these might include the longer distance trips that would be impractical by bicycle; the necessary conveyance of things that cannot be delivered or picked up by bicycle; bus journeys. We might also include journeys made by people who just don't want to use a bicycle, and would like to keep using a car; I don't think it is reasonable to stop them from doing so. What is needed is a re-balancing so that the bicycle becomes a reasonable and convenient alternative to the car for those people who currently want to cycle, but don't; the other side of the coin is that certain (short) car journeys become progressively more difficult, but not necessarily impossible. cycle infrastructure in the sort of places we need it now would still be needed because the entirety of our road network would never be given over almost exclusively for the use of cyclists. Only by pretending that our entire road network will be given over for the exclusive use of cycling would one be able to state that cycle paths will be unnecessary, because there will always be some roads, carrying vehicles, which will be needlessly unpleasant to ride a bike on. 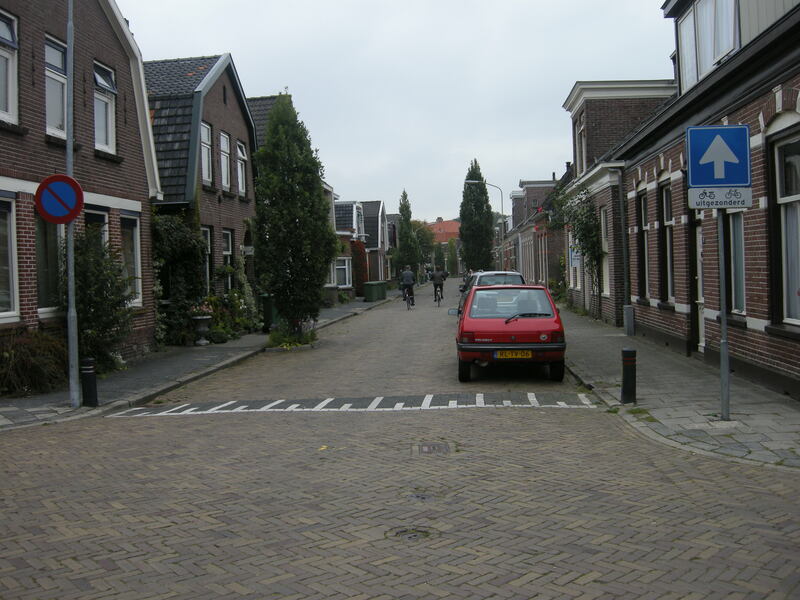 A typical Dutch residential street might look like something this. No cycle paths, but with filtered permeability and a one-way system to keep motor vehicle journeys low. From here we might move onto a distributor road. Still no segregation; however there are still a limited number of motor vehicles using this road, only to gain access to residential streets. Once we hit a through road, however, we do have a segregated cycle track. This provides a subjective level of safety from the higher number of vehicle movements along this route. Naturally enough, out of town, on dual carriageways, where vehicle movements are even higher in number, we remain segregated. that we could believe that cycle paths are 'unnecessary'. and just as consistently fails to quote anyone claiming any such thing. Conceive, if you will, of a straight, flat 10 mile strip of road with a 70 mph speed limit, with a well-designed and safe cycle path alongside it. Offer someone the choice of driving or cycling to the other end of that road, without any hindrance in either case, and it would come as no great surprise to me if the vast majority of people chose to drive. So it would be facile to imagine that the presence of a cycle path, in and of itself, is sufficient to make people cycle, regardless of context; yet this is precisely the opinion the author of the Amcambike site chooses to attribute to his opponents - that they believe 'cycle paths cause cycling'. The purpose of cycle paths is being misunderstood (deliberately or accidentally, I cannot say). A cycle path alongside a fast and/or busy road is a way of making a cycle journey that happens to progress along that road for part of its length feel safe and pleasant; it is not, principally, a way of getting people to switch, in large numbers, to a bicycle from a car for a journey that runs purely along a fast and busy road, because that would be entirely unrealistic. This is actually the lesson of Milton Keynes, because the cycle paths, and the way they fit into the geography of the town, mirror exactly this kind of hypothetical scenario I have presented. It is indeed unrealistic to have ever expected people to opt to use the cycle paths in Milton Keynes, instead of their cars, because no obstacle is put in the way of car use. Fast, flat and straight 70 mph dual carriageways whisk you in and out of the centre of town, where parking is plentiful. The cycle paths which run alongside these roads - even if perfectly designed - would never be a particularly attractive alternative to using the car, for the obvious reason that cycling into town on them, on just as straight and flat a route, is going to take longer, much longer, than driving. Naturally there has to be, along with cycle paths where they are necessary, some degree of competitive advantage to using a bicycle, of which the most obvious example would be a shorter route than an equivalent car journey. The cycle paths, or 'Redways', as they eventually turned out to be, are doubly compromised, not just because cycling and walking were afterthoughts to the central design of Milton Keynes - a network permitting fast and smooth motor vehicle journeys across the town - but also because they themselves are a poor adaption of routes which were initially designed solely for pedestrians. We can see a typical example of how this turned out in the photograph below. 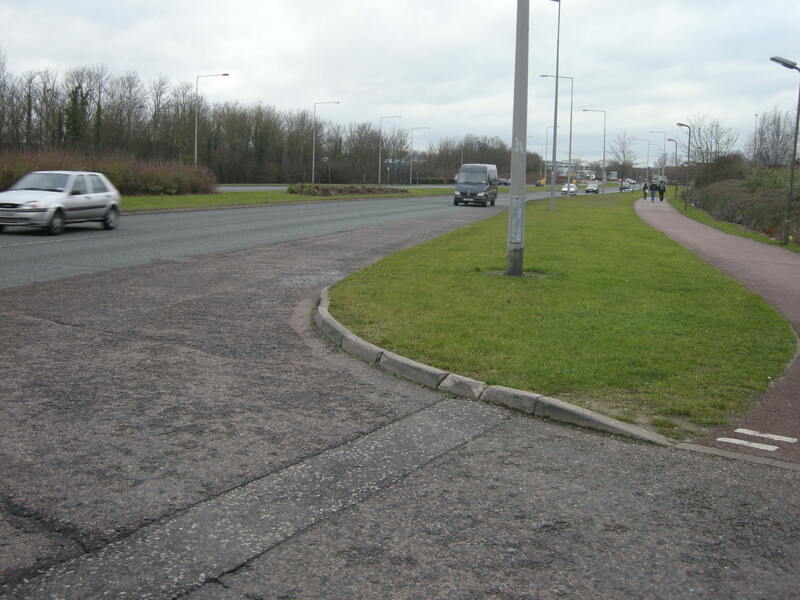 At right is a 70 mph dual carriageway; straight, and flat, it allows fast and easy access in and out of town. I am standing on the Redway, which as you can see is far from flat. As it runs parallel to the entire length of this road, at every such junction it dips up and down, making cycling a tiring and frustrating experience, especially given the fact that the land the town itself is built on is generally very flat indeed. And, perhaps because these routes were initially designed for pedestrians, the gradients on the Redways are steep. In the photograph above you can see that the path rises from well below road level, to well above it. Needless to say, this is not convenient for riding a bike. The Redways hardly provide a straight route, either. 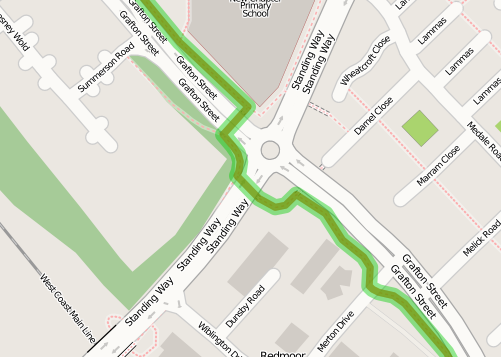 A journey along them on this road, Grafton Street, will involve switching from the west side, to the east side. And then from the east side, back to the west side. And then from the west side, back to the east side. 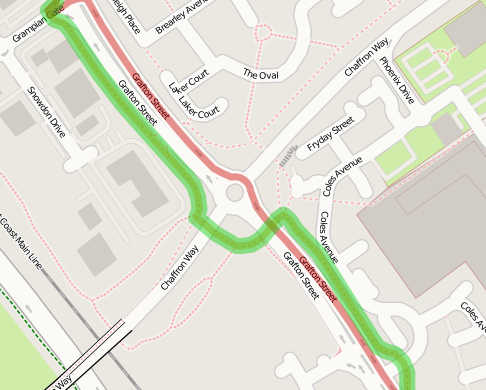 Annoyingly, it's not at all clear when the Redway switches sides as you cycle along it; at one of these roundabouts, I continued straight on, only to find myself at a bus stop with no continuing off-carriageway route. Frustrated pedestrians have evidently decided to continue on foot here, despite the absence of a pavement or Redway, leaving a muddy track. I decided to retrace my steps, double back under the roundabout, and cycle back up onto the Redway on the other side. Even if you know your route, with all these switches from side to side a short journey along the Redways besides a straight road is, absurdly, considerably longer than a journey by car on the road itself. 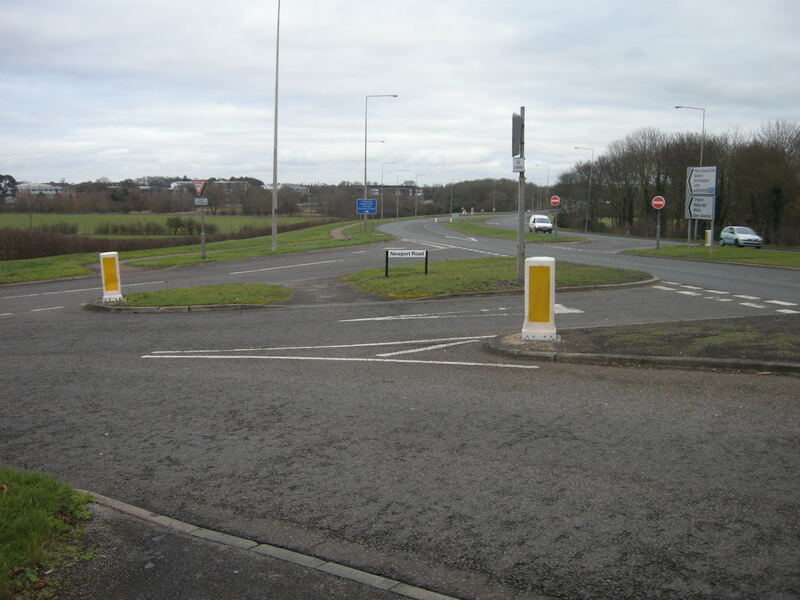 The at-grade junction treatments - those junctions where you are not pedalling up and down steep gradients to get under or over a flat road - are very poor. Naturally enough you have to yield to motor traffic, which is not necessarily a problem, but considerable danger is involved. 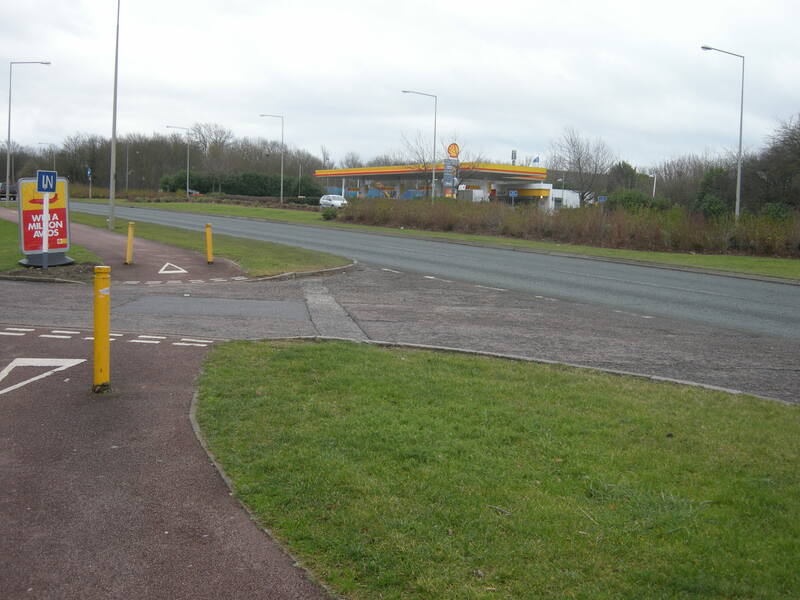 Here we have to cycle across a sliproad into a petrol station. This is a 70 mph dual carriageway. Traffic from the right approaches unnervingly fast, and there is nothing, at all, to slow it at this crossing point. The geometry of the corner is wrong, the positioning of the cycle path is wrong, and the sightlines are wrong. Another example, this time an entry into a housing area. Again, we have vehicles approaching at up to 70 mph around a wide radius bend. 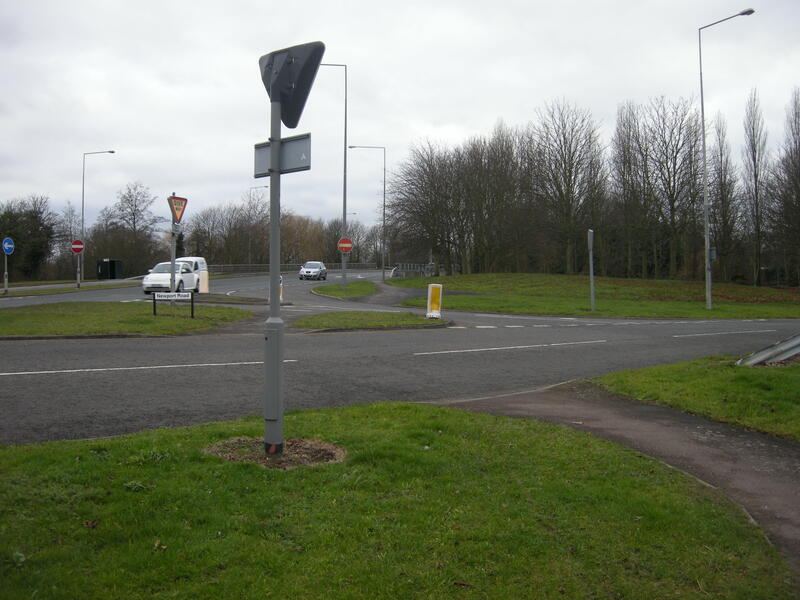 John Franklin may have abused some statistics to attempt to make a point about the safety of off-carriageway provision in Milton Keynes, but it is undeniable that a lot of these junction treatments are needlessly dangerous. This example is even worse. We have to cross four lanes of traffic, each progressing in different directions, and coming from various points on the main road. A recipe for collisions. 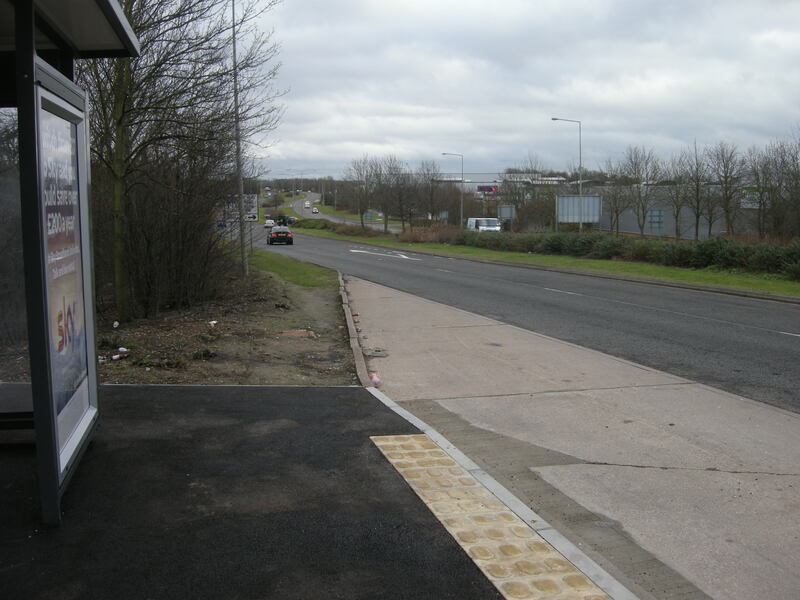 Although it looks like a pavement, it is in fact a shared use path, which starts here. 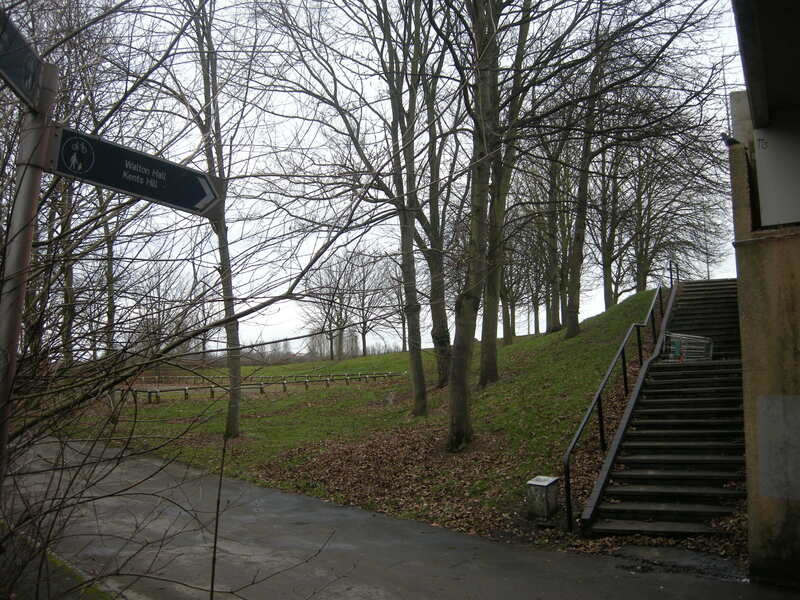 Note that you have to get up the steps with your bicycle - avoiding the shopping trolley - if you wish to use this 'facility' along the A421. These junctions are needlessly dangerous. However, unlike John Franklin, I'm not prepared to use them to condemn off-carriageway provision in general, because this is just poorly-designed rubbish that simply doesn't merit comparison with junction treatments in the Netherlands, or infrastructure done properly. 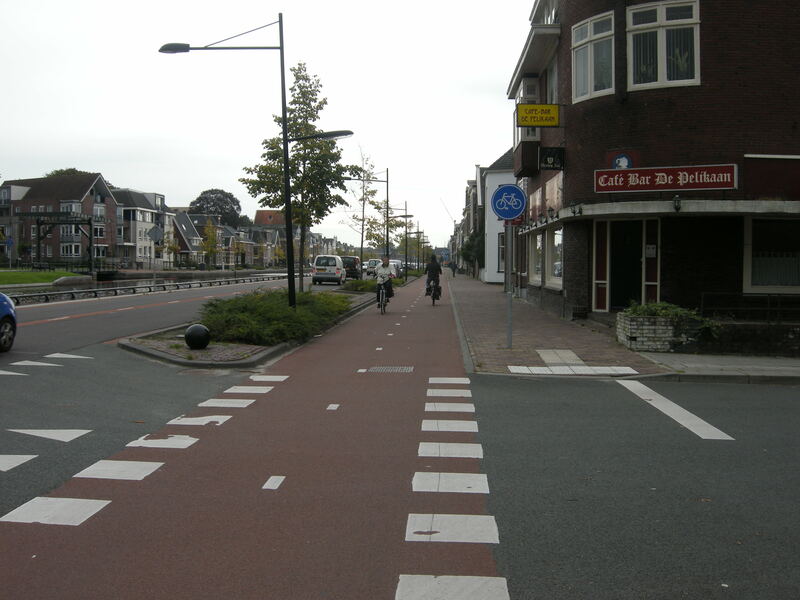 Not all cycle infrastructure is the same, nor is it designed to the same standard. 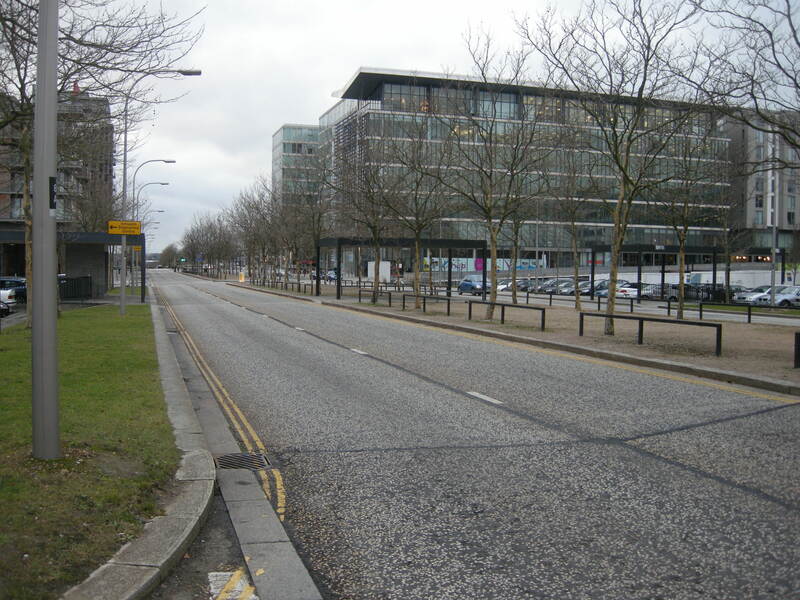 The centre of Milton Keynes, in addition, does not seem to have much off-carriageway provision, at all. Another dual carriageway. No off-carriageway provision here either. Alongside most of these dual carriageways there are large car parks, through which you can cycle, although some are blocked off with barriers. At junctions with larger roads, you can progress through underpasses to the next car park, although frequently this will involve steps, and/or no path at all to get directly out of the car park. It is hardly a recipe for convenience, and does not send out a message that the bicycle is being particularly privileged compared to the fast straight routes that exist at surface level, or indeed compared to the vast expanses of tarmac being allocated to parking. This video gives a final illustration of the difficulties involved. Having just left the station, I am cycling along a road, and wish to turn left onto a 'shared use' path that runs underneath the road I start on. I cannot do so initially because the access points are completely blocked by some thoughtlessly-placed fencing. My only way in is to double back, walk across a flower bed, and then cycle through a grotty area seemingly designed to look like a caricature of an urban dystopia. 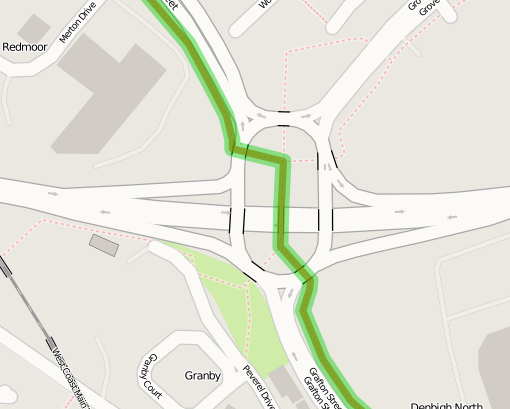 You can also see the characteristic nature of many of these 'paths', which are simply underpasses designed to keep pedestrians out of the way of motor vehicles, onto which bicycles have subsequently been permitted. There is a temptation to think that Milton Keynes is a 'special case' and that its experience is irrelevant elsewhere. But the cycling infrastructure in Milton Keynes is not inferior to that being implemented in many other places and certainly the constraints are fewer. I'll stop short of calling this fundamentally dishonest, because Franklin is not explicit about what these 'many other places' are (although the inference is surely obvious). However, if these places are indeed worse than Milton Keynes - wherever they are - they must be truly, truly awful. Regarding the quote:"Milton Keynes, Stevenage and East Kilbride all tried the oft proposed solution. They completely segregated cars and cycles which have their own completely segregated network so you never need to go near the roads." This isn't quite true for East Kilbride. EK has a number of bits of cycle facilities scattered around the town, particularly in the town centre, but mostly they don't join up to provide continuous routes. The newer parts of the town had nothing at all built in, and at best have received some shared footway redeterminations in recent years, with sometimes uncontrolled at-grade road crossings. Indeed the as-built facilities in the town centre mainly consist of roundabout by-passes where cyclists can come off the main road, use underpasses and then return to the main road on the far side of the roundabout, including the dual carriageways. See http://eastkilbride.cyclestreets.net/photomap/tags/roundabout/ for examples. Fascinating to read your observations about the Milton Keynes system. I grew up in and lived some of my adult life in Stevenage, but I worked in MK for a year. Although I was a keen user of the Stevenage cycle tracks, I never took a cycle to MK, so I only ever used the redways as a pedestrian. I did so every working day, and as a pedestrian it seemed perfectly usable. Not a lot of cycling going on, I can confirm. From your analysis, I'm now know why. As you say, the Stevenage system was different. There, the cycle tracks do mostly parallel the main roads, although there is a secondary system based on the country lanes (now closed to motor traffic) that were there before the new town. I of course wouldn't claim that the Stevenage system is perfect, but it doesn't have many of the silly features that you found in MK. I'd like to read your appraisal of the Stevenage system, if you were to visit it. I'm afraid there's no getting away from cycle-unfriendly gradients though - they didn't flatten out the "gently rolling hills" of the Hertfordshire countryside before building the new town. The sad fact is that cycle use in Stevenage is also very low. In looking for the reasons why, I think you would observe that Stevenage has also made car use very easy, with traffic jams virtually unknown even at the busiest of times. You might also observe that Stevenage, like Milton Keynes, is mainly populated by folk who are, shall we say, greatly aspirational - car ownership and use being one of their continuing aspirations. I think rather than a systematic programme in a set location (or locations) the "many other places" are quite possibly the numerous not-joined-up "facilities" created by not-joined-up "thinking" that characterise Warrington's infamous Facility of the Month, which still has no shortage of entrants. When you're talking about cycle infrastructure that cycles can't even get on to because of barriers preventing mopeds, and that has a CYCLISTS DISMOUNT sign every 50m so you can't cycle on it even when you can get your cycle on to it, and that suddenly stops with no indication of what next, it's pretty clear that, bad though they are, the Redways could plummet a lot further to get as bad as a lot of other places. Peter Clinch, often to be seen cycling in or near Dundee, Scotland. An excellent appraisal of MK. I fully endorse your observations and have always felt that John franklin has some strange agenda. I would add that the lack of any meaningful sinage and in many places none at all also discourages the use of the Redways. I work for the Open University and at times need to visit the campus in MK arriving by train. It took me about 6 trips to even begin to remeber the best route and I frequently got lost. You can also get to some areas of MK that can be a bit intimidating and I am sure this puts people off using them. The most amazing thing was that no one in MK seems to be able to give directions for the Redways and almost all i talked to who lived there had no idea that you could cycle from the station to the OU! Seldom have I seen so many straw men set up in one article: surely a fire risk? While you stop short of actually libelling Mr Franklin, you utterly misrepresent him and place your own tortuous interpretation on much of what he says, and invent many things that neither he nor anyone else appears to have said, in order to make your arguments seem reasonable. You seem to have some personal issue with Mr Franklin and find any excuse to attack him - perhaps you work for Sustrans? I have taken great pains to quote John Franklin, directly, providing links to the sources. Kindly point out where I have misrepresented him, or invented anything he might have said. Not sure why Mr Franklin needs defending with such sarcasm. The man is in my opinion wrong, not mostly wrong. Wrong. I've read this letter before and reading it again it really saddens me to read it. Mr Franklin clearly doesn't cycle with children or do his groceries on a daily basis by bike. The way those paths in MK are designed has more to do with their injury rates than the fact they are segregated, the gradients alone of underpasses in the UK, they are dangerous places! Totally unnatural territory for a wheeled vehicle. To say that segregation is to blame is to defend this rubbish half hearted design and discount all the investment, research and above all the enormous amount of daily use these segregated paths in NL get. The Dutch (and the other EU countries Franklin attacks as being namby pamby) are incredibly competent cyclists and moreover, they reach for their bike in all weathers and conditions, because they know it's safe and convenient. They know that on a wet November evening they can ride home with their 8 year old child and not get covered by a massive wave of puddle sent over them by an HGV doing 50mph. They know that there won't come a point that the rain has made the dip in the path impassable. That's the best case, the worst would of course involve death. I nearly lost my youngest boy to an HGV ont the way to school last summer in the UK, we had no crossing and our requests were all ignored. Which is why cycling especially with children on a dark November evening on a 60mph road or even crossing a 60mph road will leave any responsible parent in the UK reaching for the car keys. Every journey in the UK, I go through it in my head and there will be at least one part I would never let my 8 year old near and that's usually where there isn't even the option of walking across a crossing. What crossing? Where sight lines? RUN! Jeez that was close. I've driven to Harwich many times and as a life long British cyclist I would never ride that dual carriageway on a bike! let alone with my kids!!!! I learnt to ride a bike in 1980's rush hour Reading and I shudder now at the volume and speed now on UK roads, add that I have two children on bikes, and I say that our roads in the UK are not suitable for transportation by bike. I say that Mr Franklin is wrong, not mostly wrong. Wrong. 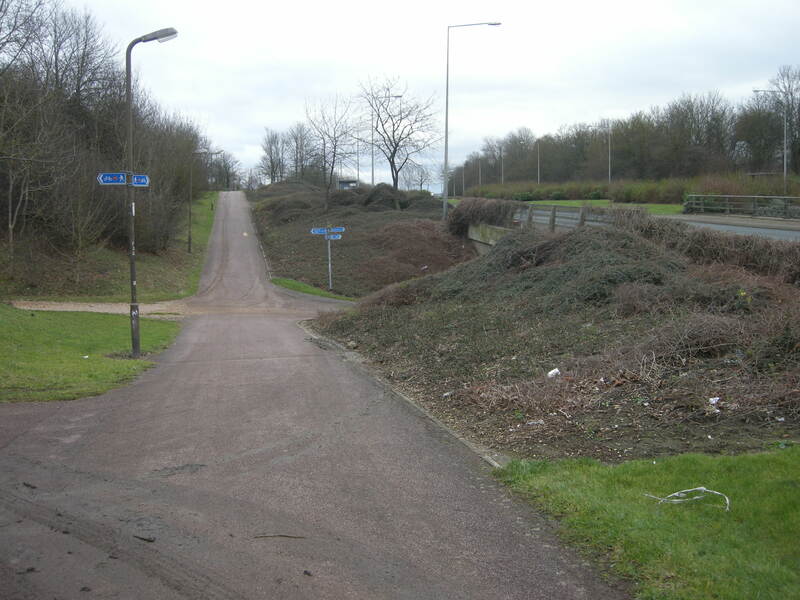 Another point is that they intended the paths in MK to be used for leisure cycling. I've always hated the concept of leisure cycling, it means in essence, like Sunday driving, going nowhere in particular. Cycling in the Netherlands is predominantly for transportation and predominantly women and children where segregation makes for relaxed and safe journeys done every day, several times a day. All those journeys in MK have to be done by car because it would take far too long to bimble round by bike up and down, round and round, over and under. Who has the patience for that? Fine if you are bimbling along for a bit of a bike ride. I've got to get my kids to school and go to work!!! !By Bike!!!! I want the fastest route! 1) the provision here has been upgraded and improved many many times over since the 1960's - Mr Franklin's vision has been the beginning and the end, they just gave up. I very much doubt the vision when Overvecht was built back in the 50's and 60's is much use to the 21st Century designers other than to excuse a few historical misgivings and mistakes. 2) the emphasis in Overvecht, where I live is liveability, lots of trees, cars at low speeds, even though it's predominantly 8 story flats, they are large and well maintained, they are all built in squares with green in the middle so we all have a 'back garden' with trees and swings, opportunities for hide and seek and even fishing, not just a scrap of grass by the side of the road like you get in the UK. There are shopping centres, health centres, and schools within walking distance. Lots of crossing points, buses in all directions, it's well lit, well sign posted and there are several parks with animals and water features all over the place. You don't need to go into the city centre if you want to buy groceries or visit your dentist, it's all there within walking/cycling distance. The centre of Utrecht is almost entirely car free. No-one in their right mind drives into Utrecht. And if you want to buy a sofa, you go the big shopping centre on the outskirts by the motorway where there are dozens of big furniture and DIY stores. Overvecht has the largest Supermarket, a library and second largest shopping centre in Utrecht and plentiful parking too. The cycle provision is segregated right up to the shops and now they are planning on a segregated lane though the carpark - How much new provision has appeared in MK since it's initial building? You read the local paper and there's always a project to improve this or build a bike bridge there. They take pride in the place. They spend money on infrastructure, they maintain the place and look for new ways to make it even better for getting around, which is after all what we have to do, every day, get around. So why does it get so little money in the UK? MK was designed, it seems for one purpose, to get by car to the centre as if you had been beamed there star trek style. Looking at the images of MK and on my own trips there, as a cyclist, I would not choose to live there. Since it's birth, it has stayed virtually the same and this more than anything else is the problem. The Dutch have made plenty of mistakes but they keep learning and they spend money on cycling. My Mum lives in a new town built in NL in the 70's. I joke with her when she says, "Why don't you live in Nieuwegien?" I say, "no Mum it's like Milton Keynes!" but it's not! it's much nicer and I realise now I've been putting it down much further than it deserves. I might not be my cup of tea but no, Nieuwegien has some of the best cycle provision now in the Netherlands despite once apon a time being built and designed around the car. There is nothing being spent currently on improving or correcting the fact that if anything, they should be swapping the car roads in MK for the shared ones tacked on after for those people not going anywhere in particular and not in a hurry. Yes, in fact I'd say that would be the answer, swap the two users over, then see who's bothering to get in their car. Now that would make it right. Have you ridden in MK much? While I agree with you more than John Franklin, you also seem to be making a lot of mistakes. “comprehensive network of segregated cycle paths” – they’re not comprehensive. There’s a lot more than most English cities, but still not comprehensive. You could do many journeys completely on the redways (and cyclestreets is a bit overkeen on trying), but you’d usually have to be some sort of perverse detour-loving person to do so. “dismally low level of cycling” – that’s misleading. Your later comment “barely better than the national average” is more accurate. Levels in the 2011 Census and the Active People Survey are a bit above average. Not as much as we’d like, but not as low as often claimed on sites like cyclechat. I suspect it also looks lower than it is because the average-ish number of cyclists is spread across a denser-than-average cycleway network. Finally, I think Department for Transport highway vehicle counts make cycling look lower than average because they only count the roads and not the redways. I do still agree that without the redways, the fast grid road system would completely cut up the city and be much worse barriers to cycling than they are. After that, this blog post improves. I agree with the argument that cycle paths and things like filtered permeability both have their place. The background of the Master Plan is as I understood it. The criticism of the indirect routes and unnecessarily dangerous junctions are ones I support. 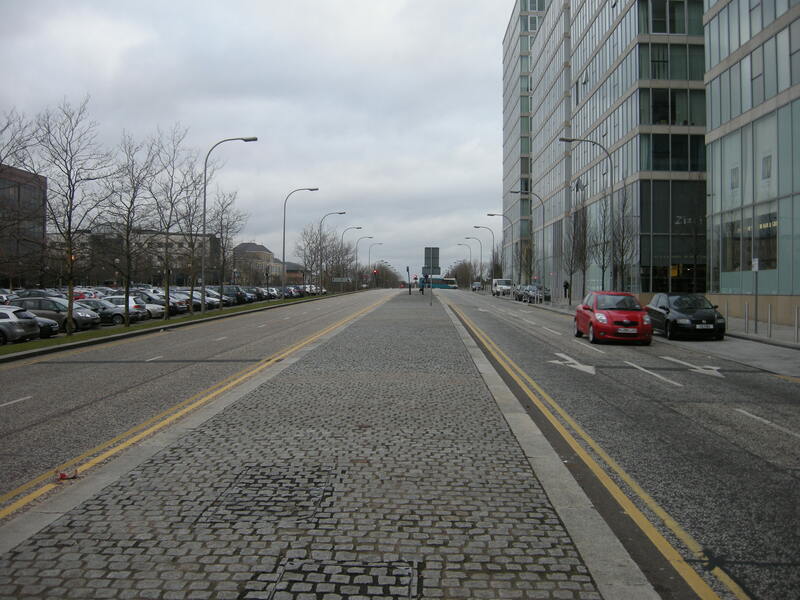 “The centre of Milton Keynes, in addition, does not seem to have much off-carriageway provision, at all” – it used to, but it was harder to spot because it’s not red like everywhere else in the city. Even the bollards in CMK were black instead of the usual redway yellow bollards. The area between the buildings and the car parks was shared-use when I rode there in the 1990s and it naturally connected with ramps into and out of the underpasses. This might have been botched since I left. Anyway, mostly you’re right but some of the details seem wrong to me. I’ve written more about my years riding the Redways at http://mjr.towers.org.uk/proj/cyclynn/redways – including an apparent curious lack of MK cyclists being killed by delivery and construction lorries when it’s a city with large warehouses and plenty of building work going on.